How often have you felt frustrated at something you do every day and you have no idea as to how you ended up in that position? Like many of us, the author of the book, Tal Gur, felt the same. He had a secure job as a software engineer and had everything that the society in general believes should keep somebody happy. However, the author decided to let it all go and pursue his 100 goals and this book is about he pursued these goals. Usually, such self-help books quote various examples from third party sources and gives a general set of instructions. 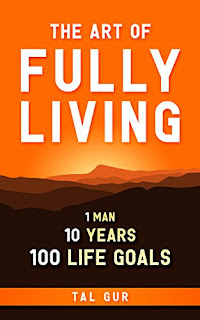 However, in The Art of Fully Living, the author makes it autobiographical and includes inter alia, how he went about achieving his goals, what were the strategies he adopted, the challenges he faced, how he handled failures and embraced rejections and how he handled things on the personal front. The book is split into ten chapters and each of them having sub-chapters within them and the author addresses most aspects that people seek in life – such as happiness, facing failure, following a passion, money, how to adapt in a completely new environment, etc. I appreciate that the author does not try to make this into a hagiography and discusses his failures in detail (things that most people face in real life) and also talks in depth about how he came out of it. I would also commend the author for the fact that one of his goals when he started the mission was to attain fluency in English and considering that as the starting point, this book is fully in English and is written very well and with points expressed lucidly. Considering this is a self-help book, I would also talk a little about the personal aspect and how much it could help me. I understand the need for the author to use an authoritative style to express his suggestions considering he has adopted those strategies and achieved his goals. However, considering some of the goals were highly personal in nature and not generic (such as the Ironman Triathlon goal), if the reader doesn’t have a similar goal, it might be difficult to connect to his suggestions. Moreover, the author talks about achieving financial independence and at the same time, work towards achieving his goals and how he went about it. But to achieve that independence, the author had a very specified skill, that is making marketable websites from which he could passively generate ad revenue while touring the world to achieve his goals and I guess most readers aren’t bestowed with such a skill for it to be implemented verbatim in one’s own life. Anyway, coming to the book, now I would mention the good things I found from the personal perspective. I got to know about the life of a very interesting person, who has travelled the world extensively, who is determined to not let go of his goals even when the achievement within the given timeline seems prima facie unlikely. 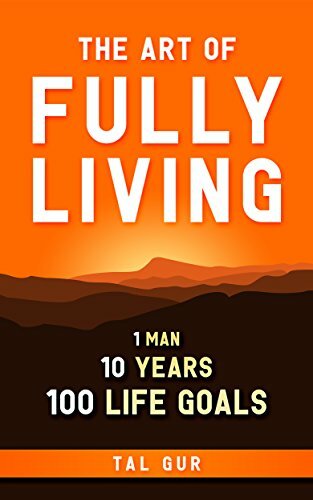 While his idea of what ‘fully living’ doesn’t coincide with that of mine, I would certainly say that a lot of strategies he suggests in the book could well be used to fulfil my own goals. To add further a point, I have already implemented some of the strategies suggested in his book and it is working very well so far. To conclude, I would say that this is a very interesting ‘autobiography’ (if I am allowed to use the term) and at the same time, also provides various useful strategies and changes that the reader could incorporate into their lives. On that note, I would rate the book a seven on ten.